In this guide we will talk about how we approached the aftermarket window installation. Our Promaster had no side widows, only 2 non-opening windows on the back of the van. In hindsight, I do wish we had ordered the “opening” windows for the pro-master, but it is a small issue and we are happy with the current setup. 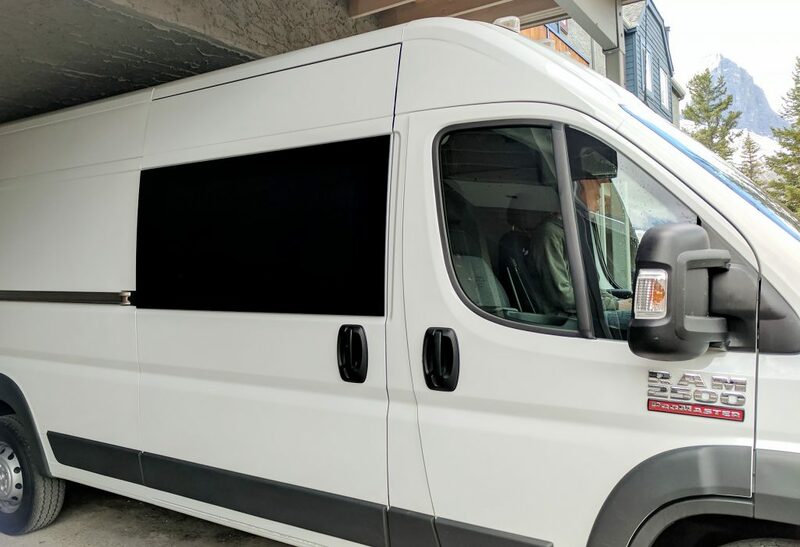 Based on our research (and somewhat limited information) we went with a CR Laurence FW385RFG fixed window which we ordered through Cal-Alta Auto Glass in north Calgary. The window cost ~$450, and we picked it up ourselves from the warehouse in the SE. On a side note, I HIGHLY recommend both Cal-Alta, and CR Laurence based on the experience we had. Very high quality products, and very easy to install. The window game with a bead, and a bunch of screws. 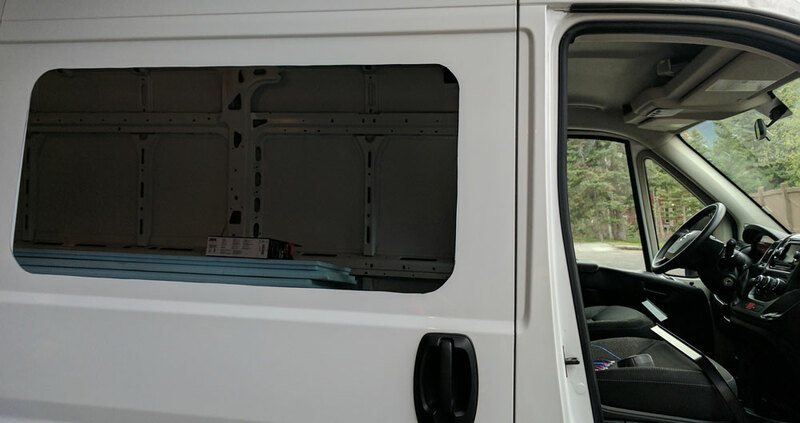 The window is OEM, and is designed to fit perfectly into the window outlines in the van itself, making it VERY easy to align and cut. The first step we did was to cut out a template using the window as a guide, and cardboard as the medium. Surprisingly, the window is larger than you might think, and finding good quality cardboard was a bit tricky. The cardboard cutout is mainly to limit the gap around the corners. 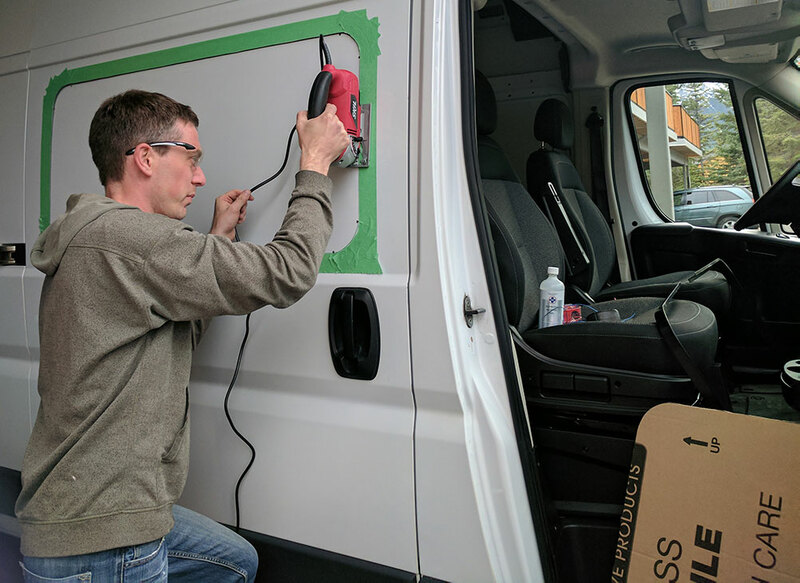 While the metal outline on the inside of the van makes it easy to see where to cut, you can’t fit a jigsaw on the inside, so using the cardboard cutout, in conjunction with the outline on the inside of the van to drill pilot holes is a key step. Make sure the pilot holes are large enough to fit your jigsaw blade into. This is important as it will help prevent tearing of the metal, and any additional scratches from the jigsaw. Step 5 – Take a DEEP breath, and start cutting! We used a jigsaw with a very high quality metal cutting blade (don’t cheap out! ), and had no problems at all. Go nice and slow, and get a friend to help grab the metal once you get near the end. Step 6 – Install the Window itself. It’s very easy to install the window, as you simply get a friend to hold the window in place, and you screw in a tight metal bead into the back which serves to make the seal permanent. Be sure to go slow, and start by tightening each screw a bit of a time, and then continue to go around multiple times, adjusting each screw a few turns each go. This will help ensure you don’t warp anything, and you end up with a nice even, tight seal. The finished window opening, prior to installing the window.